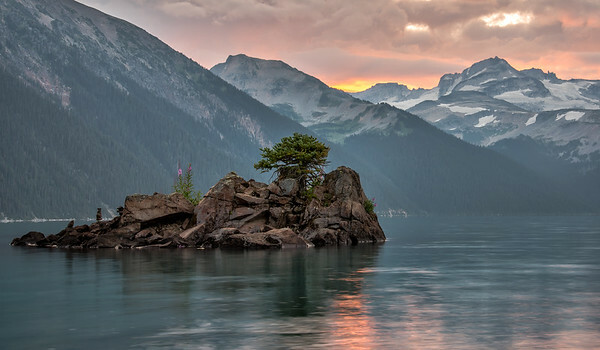 It is impressive how this tree took root on a rocky island in the middle of the lake. Don't think it will get very big but it has the island all to itself. 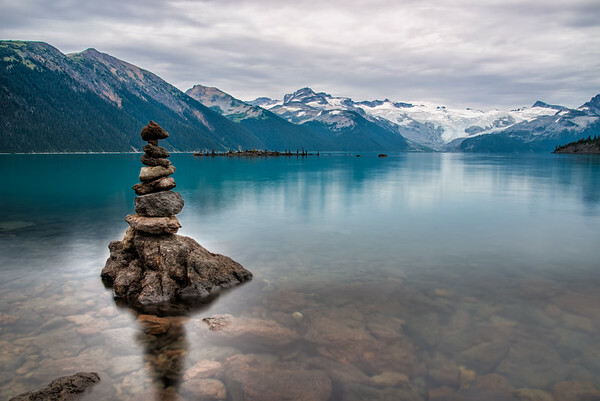 Lots of rocks piled up around the sore of Garibaldi lake. This is a glacier fed lake so it is very cold year round. So it is pretty impressive that someone swam out to the island in the distance to pile the rocks. This place is called Panorama ridge so I had to try a panorama photograph, it just would not have been right if I didn't. It definitely is an amazing panoramic view. 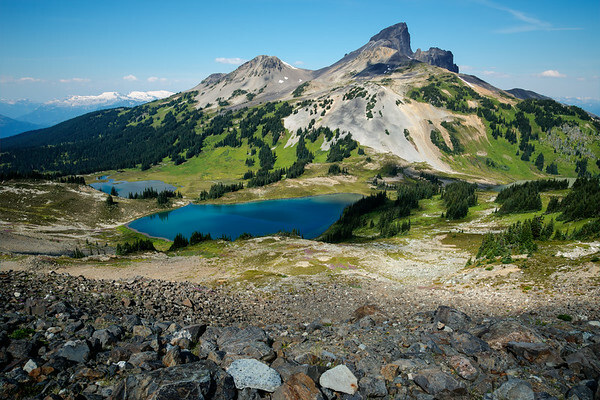 The peak is called black tusk and is above some beautiful blue lakes in Garibaldi park in British Columbia. 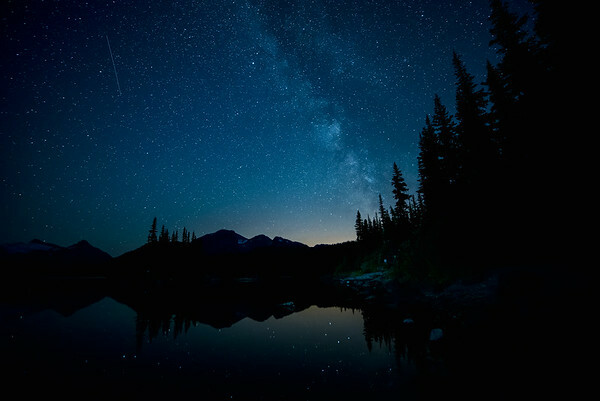 The milky way from Garibaldi lake up near Whistler. It is a long hike to get up there but worth it once you arrive. 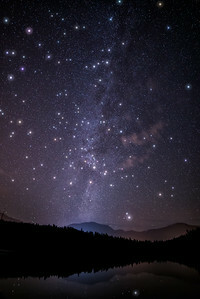 The milky way surrounded by twinkling stars. 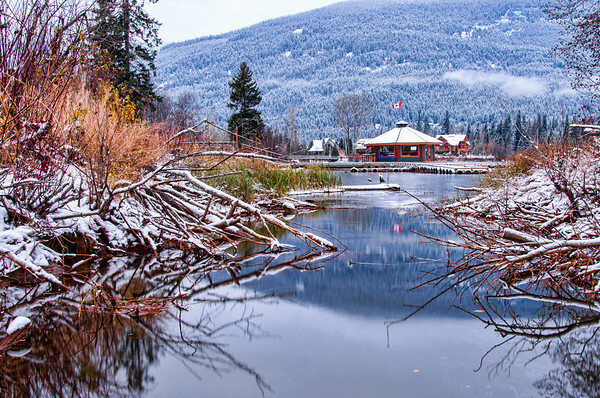 Before Whistler was known for its mountains, Alta lake was the main attraction for fishing and a weekend getaway. These days Whistler and Blackcomb get all the attention but Alta Lake is a still an amazing place to visit in the summer. 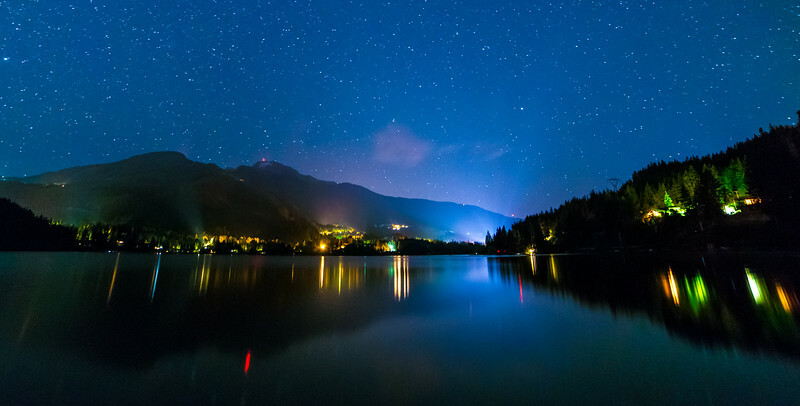 The lights along the shore of Alta Lake up in Whistler BC. 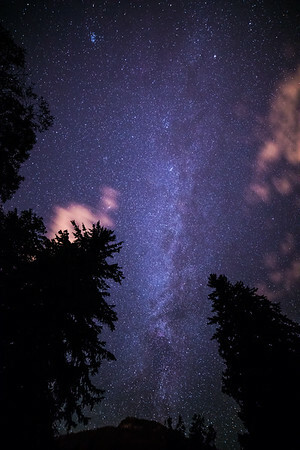 I was admiring the amazingly bright milky way up in Whistler when the clouds that were slowly moving across the sky broke to either side of the milky way long enough for me to get this shot from between the trees. This is the clearest I have seen the milky way so close to Vancouver. I just got back from a great weekend up in Whistler. 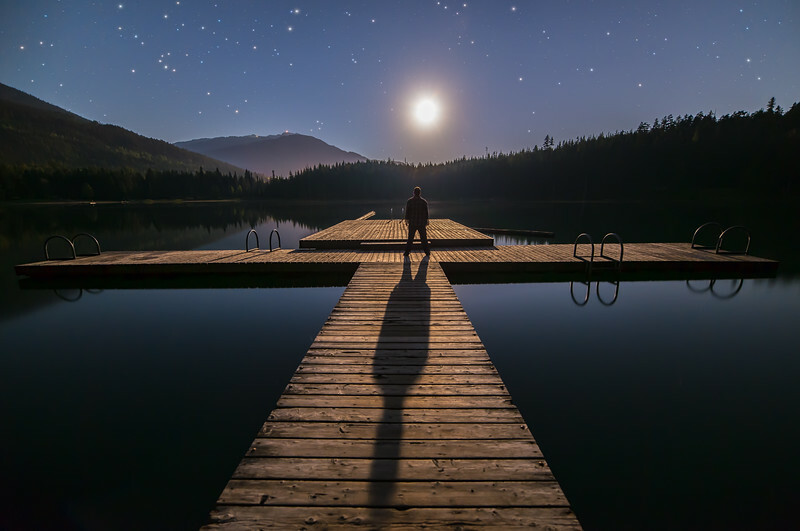 I took this photo Friday night at Lost Lake. 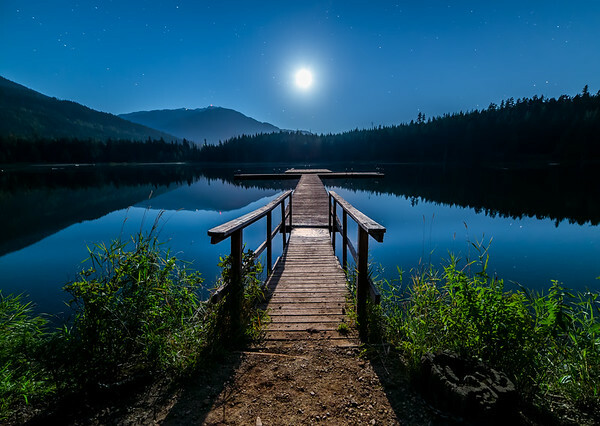 The moon was two thirds full but it was totally clear so the moonlight really lit up the lake. I normally do not include people in my landscape photos but decided to pose in this one. What do you think? Do you think it is better with me in the photo or if I stayed out of the way? Last time I visited Lost Lake I took a photo of this exact scene in the morning. This time I went back at night. I like the night version better. 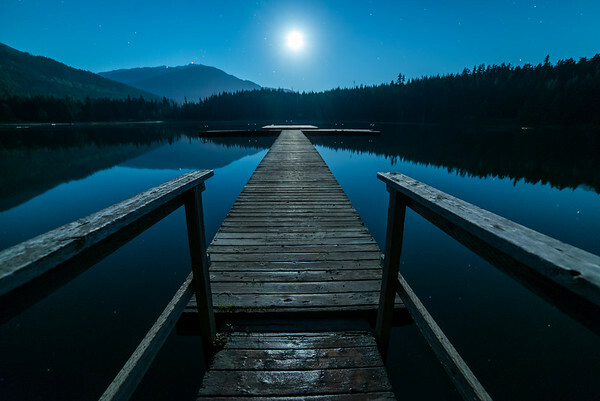 Stepping onto the dock at Lost Lake in Whistler. 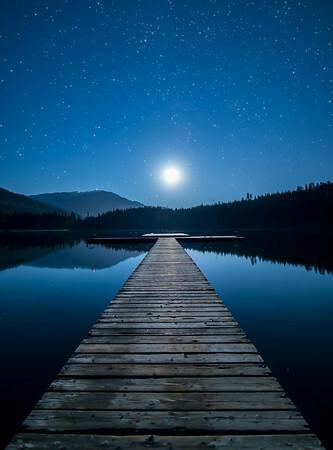 I spent an hour photographing this dock during by the light of the moonmoon. This was the first photo I took as I approached the dock and knew right away I was going to get a bunch of good photographs over the next hour. The great thing about photographing the moon is that the light does not change very quickly. Sunset only lasts for 30 minutes to an hour but the moon moves slowly across the sky for hours. So it is easier to sit back and play with the camera until you get a photo you like. Great weekend up at Whistler. The first day was sunny and clear and the second day we got snow! 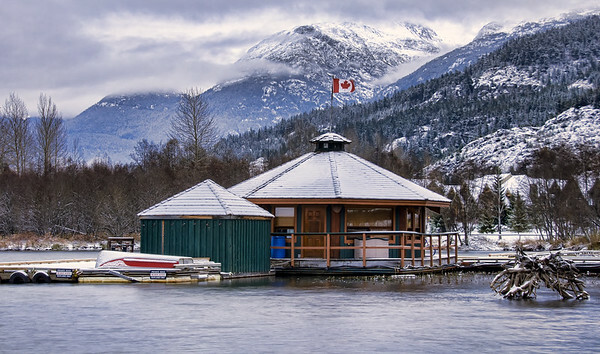 Here is the Whistler Air Float Plane Base with a dusting of snow. Green lake was not look so Green when I took this photo. 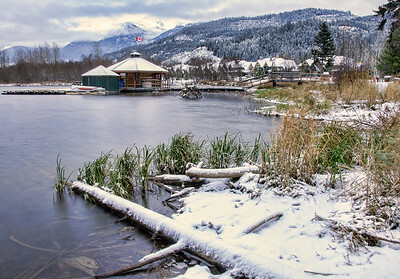 This snow fell a day earlier and was the first snowfall of the season in Whistler Village, much more to come.